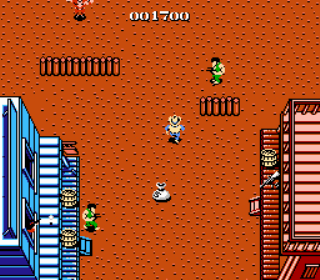 Gun.Smoke is a pretty unique game in that it has all of the game play mechanics of a vertically-scrolling shooter, but you don’t fly a plane or a space ship. You play the role of a wild west vigilante who kills the leaders of various groups of bandits who have been harassing the town of Hicksville. The citizens of Hicksville have posted bounties and offer their help throughout the game by selling you needed supplies such as weapons upgrades and horses. These upgrades are paid for with the normal points that you accumulate through playing the game. Each level takes place in a unique location, and the boss for each level can only be fought after their wanted poster is either found or purchased, until which time the level continuously loops. The game’s difficulty is challenging for beginners and ramps up as the game goes on, but never feels frustrating or unfair. The graphics are colorful and detailed, and even though there is usually a lot going on on the screen there is almost never any slowdown. Unlike most other shmups however, you can shoot in three directions. B shoots front left, A shots front right, and pressing both simultaneously shoots straight ahead. This leads to my only real gripe with the game, and the reason that it doesn’t get a perfect score. With most shmups, shooting straight ahead is the bread-and-butter move, but this game makes it hard to do repetitively, so you are stuck with shooting at diagonal angles all the time. This is easily adjusted to and really isn’t Capcom’s fault since the NES controller only has 2 buttons, but it makes the game inferior to the original arcade version. That fault aside, the game’s originality and great gameplay make it a must-have for the shmup-loving NES owner. Buy Gun.Smoke on GameGavel or Amazon. Tagged Arcade, Capcom, Gun.Smoke, NES, Nintendo, Review, Shooter. Bookmark the permalink.